This October, treat yourself or someone special to a nice early Holiday present - a beauty box packed with goodies. Or, even better, a trio of beauty boxes that will arrive every month from now until Christmas. Or, if you like a bigger beauty fix, why not order an Advent Calendar where you can get a surprise every day for 24 days in December? From the UK to Israel and Korea, here are the top beauty box buys this month. Scroll down for the lowdown on the best October 2015 beauty boxes that ship worldwide and where to buy them. From October till December, LookFantastic has a special trio of beauty boxes with keepsake Christmassy designs. I can tell you that the October box has a full-sized makeup brush and more! I can't wait for my first box to get here - watch out for the review over the next week or so. This trio means you get a nice treat for the next three months. This is not strictly a beauty subscription, but an Advent Calendar with 24 beauty goodies is the mother of all beauty boxes, innit? This ships out from November 1. I expect the amazing Nuxe Dry Oil (reviewed here) to be in this because it is such a cult product. What the other products are is anyone's guess, though they have said it includes a product that Vogue describes as the "World's best cleanser" (Eve Lom?). Go for it - it is supposed to be worth £250 but costs £70! A mini polish for each day of your Christmas countdown, this ultimate "box" for the nail polish lover comes in cute packaging. Of the 24 polishes in here, one is full-sized while the rest are minis. Every shade you need is in here, including Summery pastels and deeper shades and glitter toppers, and a mini nail file. Ever wanted to try out a cushion compact? Here is your chance to actually BUILD YOUR OWN! The ultimate beauty box for the DIY and makeup enthusiasts out there, this Korean beauty box comes with a bunch of makeup and skin care (SPF, serum and moisturiser) products that you can mix to get custom coverage, and you can store the self-made foundation in the accompanying cushion compact and decorate it with the stickers provided and cutify it to your heart's content! Plus, you also get a concealer and extra sponges and puffs free! Shipping costs vary from $8-$12, but get 10% off orders above $55 with code WISHOCT2015, or a sheet mask free with code WISHGIFTOCT2015. Reviewed by me here. Customised according to your beauty profile, this Israeli beauty box is jam-packed with regional brand products in generous sizes, and there is makeup and skincare to boot. I have seen Autumn/Winter lipsticks in some boxes but since I only wear dusty rose, I wasn't sent one (which is great). Everything I got is so usable and worth the $27.50 that the box costs! 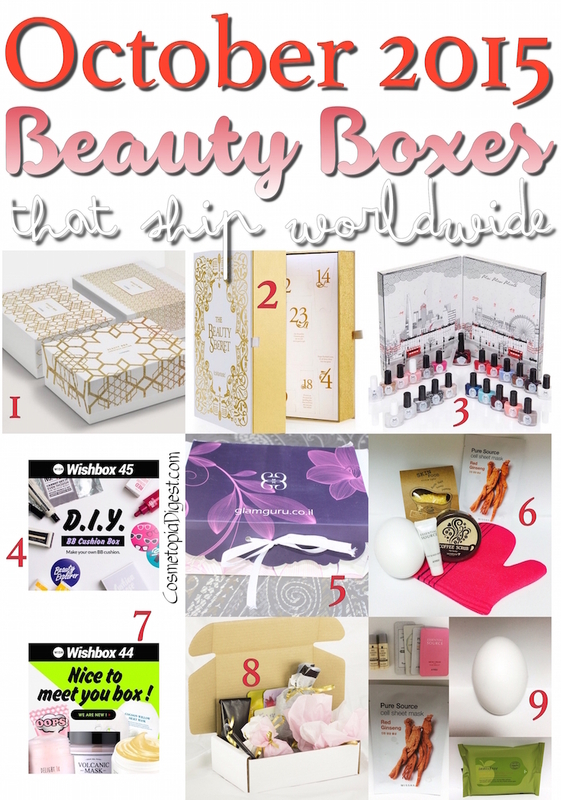 K-Beauty fans, meet yet another beauty box that ships worldwide! This one is a "Fall is coming" special that contains everything you need to ward off rough skin in the dry weather. International shipping is free, and you get a spoiler before you buy - I bet you fall for that cute egg packaging! Get your introduction to Korean skincare here. This box contains a sleeping mask, a sheet mask, a face cream and two other full-sized products - five deep moisturising, nourishing, pore-tightening and revitalising products. Shipping costs vary from $8-$12, but get 10% off orders above $55 with code WISHOCT2015, or a sheet mask free with code WISHGIFTOCT2015. Click on each box to buy - they sell out VERY quickly and contain full-sized products. Don't blame me if they are already out of stock by the time you click the links. International shipping costs $10 extra but is free to the US and Canada. A mini and more affordable version of #6. This contains some of the full-sized products in #6 and a couple of minis. Spoilers are shown in the photos and international shipping is free. As if all those weren't enough, there is a TENTH beauty box that ships worldwide - a Korean mask box! Great value for money, this is a good way to stock up on sheet masks and to try new varieties. What are you buying this month? Made any Holiday purchases yet? Tell me in the Disqus comments widget below.